To overcome harmonic structure distortions of complex tones in the low frequency range due to the frequency to electrode mapping function used in Nucleus cochlear implants, two modified frequency maps based on a semitone frequency scale (Smt-MF and Smt-LF) were implemented and evaluated. The semitone maps were compared against standard mapping in three psychoacoustic experiments with the three mappings; pitch ranking, melody contour identification (MCI) and instrument recognition. In the pitch ranking test, two tones were presented to normal hearing (NH) subjects. The MCI test presented different acoustic patterns to NH and CI recipients to identify the patterns. In the instrument recognition (IR) test, a musical piece was played by eight instruments which subjects had to identify. Pitch ranking results showed improvements with semitone mapping over Std mapping. This was reflected in the MCI results with both NH subjects and CI recipients. Smt-LF sounded unnaturally high-pitched due to frequency transposition. 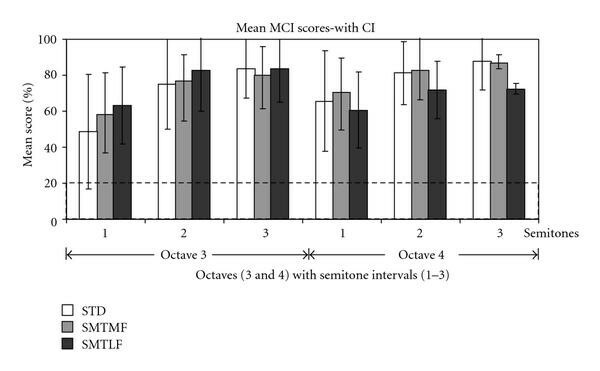 Clarinet recognition was significantly enhanced with Smt-MF but the average IR decreased. Pitch ranking and MCI showed improvements with semitone mapping over Std mapping. However, the frequency limits of Smt-LF and Smt-MF produced difficulties when partials were filtered out due to the frequency limits. Although Smt-LF provided better pitch ranking and MCI, the perceived sounds were much higher in pitch and some CI recipients disliked it. Smt-MF maps the tones closer to their natural characteristic frequencies and probably sounded more natural than Smt-LF. Many postlingual recipients of cochlear implants (CIs) who achieve good speech recognition with their devices report that music is not well perceived. Music consists of complex acoustic sounds composed of tones with harmonically related overtones. Most musical instruments generate fundamental frequencies below 1 kHz  which points to the importance of preserving low frequency sound components for music perception. In a companion paper, two semitone (Smt) frequency mappings were proposed to improve melody representation with CI patients . Smt mapping essentially involves assigning the fundamental frequencies of adjacent tones on the musical scale to corresponding adjacent electrodes or channels. This also requires that the frequency to electrode/channel mapping is based on a semitone scale. The idea was initially investigated in a study by , using the 12 electrode Clarion CII (Advance Bionics) implant with a limited range of semitone frequencies. The Smt mappings investigated in this study, Smt-LF and Smt-MF, cover the frequency ranges from 130 to 1502 Hz and from 440 to 5009 Hz, respectively. Smt mappings preserve the representation of harmonic structure of musical tones for the CI. This may help to improve music appreciation. Psychoacoustic tests can be carried out to evaluate various dimensions of music perception such as pitch, melody, and timbre. Frequency representation, loudness, and temporal resolution are important characteristics that affect music perception. To examine music perception with Smt mapping in this study, three psychoacoustic tests (pitch ranking, melody contour identification (MCI) , and instrument recognition (IR)) were conducted with the three experimental conditions (Standard (Std) ACE (advanced combination encoders), Smt-LF, and Smt-MF mappings). Pitch ranking and MCI tests were carried out with normal hearing (NH) subjects listening to noise band vocoded representations of the test sounds while MCI and IR tests were carried out with CI recipients. An improved representation of the harmonic structure through Smt mapping against the Std mapping is expected to also yield better preservation of partials in individual tones on the musical scale, particularly towards higher frequencies. However, the harmonic relationship of low frequencies is expected to be preserved more than Std mapping. Pitch ranking was employed to determine whether Smt mapping produces the expected improvement in resolution over Std mapping. The test involved synthetic complex tones with a harmonic structure, similar to musical tones, rather than signals that only excite single electrodes. This test was mainly intended to check whether Smt mapping is viable, and it was decided that conducting these tests with NH subjects only would help expedite the testing. Testing with NH subjects requires that the processed signals of Std or either Smt mappings, originally meant for presentation to CI recipients, be made audible. This was achieved by additional processing of these CI signals with an acoustic model (AMO) which resynthesizes and simulates the sound of a CI . The AMO outputs are then presented to the NH subjects. Melody is an important aspect of music  which can be described as a group of tones perceived as a single entity . Each tone has a harmonic structure of overtones, and preserving this structure (as with Smt mapping) may improve melody perception. The Pitch Ranking test above involving only single tones yields little direct information about melody perception. A more complex task that would reflect melody perception would necessarily involve a sequence of tones. Galvin et al. provided a very good overview of the shortcomings of many existing tests that attempt to measure melody perception. The MCI test  which they developed was chosen for this study. The MCI test was carried out with the three mapping conditions, first with NH subjects and then with CI recipients. Timbre (tone color) is another aspect of music, by which different instruments are characterized . Timbre depends on the relationship between intensities of different partials as well as the presentation of the temporal fine structure. In the IR test, sounds from different musical instruments encoded using the different mappings were presented to the subjects. The experimental task was to identify the instrument by which the sounds were played. As the mappings in this study do not explicitly present any fine structure information, this test investigates whether the expected improvement in representation of the harmonic structure using Smt mapping would be beneficial for timbre recognition. This test was only conducted with CI recipients. (i)The discriminability of two complex tones separated by only a few semitones will improve with Smt mapping compared with Std mapping due to better preservation of the harmonic structure. (ii)Smt mapping will yield higher MCI scores than Std mapping. Ambiguities may occur with Smt-MF mapping at low frequencies due to filtering out partials below 440 Hz, and the performance may decrease with Smt-LF mapping because frequencies are transposed to higher ranges. (iii)Improving frequency representation with Smt mapping may improve instrument recognition compared to the Std mapping. One way to improve melody representation would be to ensure that the fundamental frequencies of individual tones on the musical scale are assigned to separate electrodes. Such an approach involves mapping fundamental frequencies of musical tones to electrodes based on a semitone scale. In this study, two different Smt mapping ranges were investigated. The first one, Smt-LF, is restricted to the low and mid frequency range (130–1502 Hz) using a buffer of 512 points which is zero padded before undergoing a 2048-point fast Fourier Transform (FFT). Smt-LF yields a resolution of 7.8 Hz for frequencies below 1054 Hz, and 31.25 Hz for higher frequencies. The second mapping, Smt-MF, considers frequencies in the mid and high frequency range (440–5009 Hz) and involves a 512-point FFT, giving a resolution of 31.25 Hz. The Std mapping uses a 128-point FFT with a resolution of 125 Hz. All three mappings use overlapping data buffers, the amount of overlap depending on the stimulation rate such that at the end of each stimulation period, as much new data (sampled at 16 kHz) as possible is added to the data buffer. Details of the algorithms are given in a companion paper . The pitch ranking test was intended to examine whether the Smt mappings would produce better resolution of complex tones compared to the Std mapping. This test was conducted with NH subjects and involved using the AMO to process the test signals with Std, Smt-MF, and Smt-LF mappings before being presented to the subjects. The AMO, which is described in greater detail in a companion paper  also employed modules from the Nucleus Matlab Toolbox (NMT) from Cochlear Corporation . The signals used for the test were synthetic complex tones which had the same fundamental frequencies as corresponding musical tones. Each tone had four harmonic overtones with successive 20% decrease in amplitude. To avoid envelope cues, all tones were designed to have the same temporal envelope, namely duration of 500 msec including 30 msec fading in/out at the beginning and the end, respectively. However, there are still periodicity cues in the temporal domain. The root mean square (RMS) energy of the signals (in digital form: WAV file format) was set to −15 dB, where 0 dB corresponded to the RMS signal energy of the maximum peak-to-peak waveform, to prevent saturation effects. Subjects were presented with two synthetic complex tones processed by the AMO at a time and were asked to indicate the one higher in pitch. Each presentation consisted of a probe and a reference tone. The fundamental frequency of the probe was higher than that of the reference by 1, 3, or 6 semitones. Two reference tones D and G# in octaves 3, 4, and 5 were used and the full set of tone pairs tested is summarized in Table 1. The signals used in each presentation can be separated into three groups with different interval sizes, each consisting of 6 tone pairs with two references D and G# in octaves 3, 4, and 5. The above signals were processed by the AMO with the Std, Smt-MF and Smt-LF, mappings before being presented via loudspeaker to the NH subjects. For this test, the AMO was set to simulate CI stimuli that had a stimulation width (spread of excitation) of 1 mm [5, 10]. The AMO also incorporated virtual channels, produced by stimulating two adjacent electrodes simultaneously with the same current level, which had been found to result in intermediate pitch percepts  compared to either of the corresponding single electrode stimuli. Virtual channels increase the total number of channels from 22 (for the Nucleus implant) to a total of 43 channels, thereby also increasing the frequency representation. In each presentation, the reference and probe tones were presented in random order, separated by a gap of 500 ms between each tone. A single test session involved presenting each of the 18 tone pairs, summarized in Table 1, a total of 4 times. The tone pairs were presented from a calibrated loudspeaker (Genelec 1029A) at 65 dB(A) located 1.5 m in front of the subject. The loudness of each tone was roved by ±6 dB to minimize the effects of loudness cues on the pitch-ranking task. Initially, the original unprocessed tones were presented and tested to familiarize the subjects with the task. For this condition, the test was conducted once, that is, each tone pair was repeated a total of 4 times. Testing the unprocessed tones also served to establish that the test material was not too difficult to begin with. Thereafter, testing proceeded with the AMO outputs for the Std, Smt-MF, and Smt-LF mappings. The order of testing of the three mappings was randomized. For each mapping condition, a training session with correct/wrong feedback was first carried out. Two test sessions without feedback were then carried out, and the results from these two sessions were collected for the final results. Thus, the results consisted of a total of 8 presentations of each tone pair for each subject. A total of 8 NH subjects were evaluated for this test. A custom test software (MACarena)  was used to playback sound files and record the responses. Melody contour identification (MCI) is a test originally designed and proposed by . In the MCI test, subjects were presented with a sequence of tones and had to identify the corresponding contour pattern. 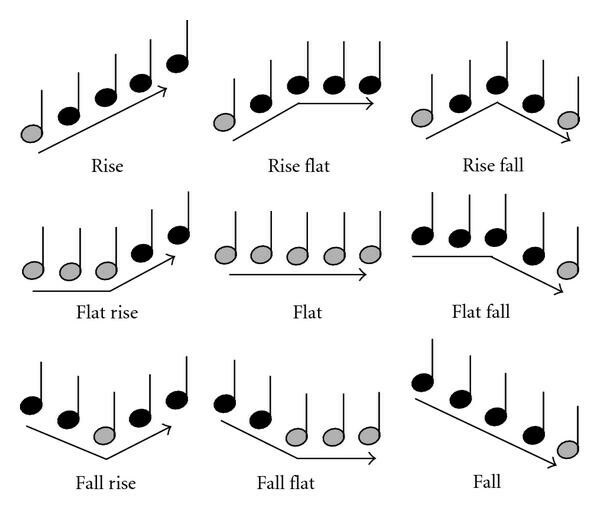 For each contour pattern, the lowest note was regarded to be the root note, which was kept the same for all nine patterns (rise, rise-flat, rise-fall, flat-rise, flat, flat-fall, fall-rise, fall-flat, fall) as shown in Figure 1. The nine different melody contour patterns used in the MCI test with NH subjects. The root notes are indicated with gray filling. Each pattern consisted of a sequence of five synthetic complex tones. For this study, each tone in turn consisted of five harmonic partials. The fundamental frequency of each synthetic complex tone was the same as its corresponding musical tone. The amplitude of each partial was reduced successively by 20% compared to the previous one. To avoid envelope cues, all tones were designed to have similar temporal envelope structure, and the RMS energy of each pattern was normalized to −15 dB, where 0 dB corresponded to the RMS signal energy of the waveform with maximum amplitude. However, there are still periodicity cues in the temporal domain. Each tone in the pattern had a duration of 250 ms with a 50 msec pause in between tones. Tones were faded in/out with a 10 ms Hanning window at the beginning and the end, respectively. A root note of "A" was used for all the contour patterns, the same as was used by . The MCI test was carried out first with NH subjects. The interval size was varied between 1 and 5 semitones in octave 3, between 1 and 3 semitones in octave 4, and between 1 and 2 semitones in octave 5, as summarized in Table 2. Summary of the semitone interval sizes between successive tones in the contour patterns as well as the octave ranges that were investigated for NH subjects and CI recipients. For NH subjects, the different patterns were processed by the AMO with the Std, Smt-LF, and Smt-MF mappings using a 1 mm stimulation width and 22 channels. The patterns were presented at a level of 65 dB(A) at a distance of 1.5 m in front of a calibrated loud speaker (Genelec 1029A). Test subjects responded via a touch screen by indicating the corresponding button containing the graphic display of the corresponding MCI pattern as shown in Figure 1. At the start of a test, the subjects were allowed to first familiarize themselves with the MCI contours in a condition expected to be easy: for instance, octave 4 with 3 semitone intervals. In this testing phase, pressing a button on the touch screen would present the corresponding sound over the loudspeaker. After they had heard each pattern at least once, a training session with correct/wrong response feedback was conducted. A single test session involved presenting each of the 9 contour patterns with each of the 10 interval-size/octave conditions once. After 1 training session (with feedback), 2 test sessions (without feedback) were conducted. A total of 8 NH subjects were evaluated for this part of the MCI test. The nine patterns designed by Galvin et al. were utilized to test the NH subjects. However, the large number of response choices proved to be too demanding for some CI recipients in initial testing, and therefore, in order to simplify the test, only five patterns were subsequently utilized to test CI recipients as shown in Figure 2. The five different melody contour patterns used in the MCI test with CI recipients. The root notes are indicated with gray filling. For the CI recipients, octaves 3 and 4 with interval size from 1 to 3 semitones were tested. Testing in octave 5 was eliminated (see Table 2). This elimination was achieved by studying NH responses, and it was found that tones with one part being flat are likely to be misperceived with Smt mapping in cases when the fundamental is filtered. To simplify the test with CI subjects, all such tones were eliminated. Conditions with one-semitone intervals were processed with 22 channels and represent effectively a resolution of two semitones. Another pitch ranking study with NH using 22 and 43 channels showed no significant differences. Therefore, it is assumed that results from CI recipients with 22 channels are representative to those with 43 channels. Testing was done using the MACarena  software which allowed randomized sound presentation and automatic recording of subjects' responses. Testing with CI recipients involved stimuli being streamed directly to the implant using the Nucleus Implant Communicator (NIC) research software from Cochlear Corporation . Stimuli were first prepared offline using a custom Matlab "Checker" program which implemented the Std, Smt-LF, and Smt-MF mappings. The Std mapping is the default implementation in the Nucleus Matlab Toolbox (NMT) from Cochlear Corporation, whereas the Smt-LF and Smt-MF mappings are custom implementations. Firstly, the latest speech processor map for each CI recipient was loaded from a clinical database. The WAV files for the different MCI patterns were then loaded and processed for all three mappings. For this test, the "Checker" program was set for 22-channel output, testing 43 channels with CIs was eliminated due to technical constrains and time limitations of the project. The resulting output was ensured that the stimuli were calibrated to correspond to an equivalent acoustic level of 65 dB(A). The resulting output was a sequence of parameters that when streamed to the CI would produce a corresponding sequence of stimulation. To meet safety requirements, the entire output sequence was verified to ensure that none of the parameters exceeded the limits set by the corresponding CI recipient's individual speech processor settings. Once the sequences had been verified, the "Checker" program stored them offline as XML files. During a test, the corresponding XML files for the selected CI recipient were streamed to the L34 speech processor. The MACarena test software had been provided with an additional output option which allowed direct streaming of CI stimulation sequences from XML files via the L34 speech processor. As with the NH subjects, a test began with the CI recipient being familiarized with the MCI signals in a higher octave (octave 4) and large interval size (3 or 4 semitones) (e.g., octave 4 with 3-semitone intervals) for the three mappings used in order to avoid learning effect which may influence the scores. This was then followed by a training session with correct/wrong response feedback using test signals. A single test session involved presenting each of the 5 contour patterns with each of the 6 interval-size/octave conditions twice. After one training session (with feedback), two test sessions (without feedback) were conducted. A total of 8 CI recipients were evaluated for this part of the MCI test. All subjects had at least 1 year's experience using a CI device. All of them used the Nucleus Freedom CI24RE contour array implant and Std mapping. The first 8 bars from the music piece "Vem kan segla förutan wind?" (traditional Swedish folksong) played by professional musicians on eight different instruments (Trumpet, Trombone, Flute, Clarinet, Violin, Cello, Guitar, and Piano) were recorded and used as the basis of the test material. Dividing each recording into submelodies of 2 bars each then produced a total of 4 "pieces" per instrument. The instruments could be divided into four families, namely Brass, Woodwind, Bowed Strings, and Struck Strings, each consisting of two instruments (see Figure 3). In the IR test, the listener was required to listen and identify the instrument used to play the piece being presented. The eight different instruments from four instrument families (Brass, Woodwind, Bowed Strings, and Struck Strings) used in the instrument recognition test. As with the MCI test, the signals were presented via streaming to the CI recipients with the L34 speech processor. The signals were preprocessed with the Matlab program "Checker" for all three mappings (Std, Smt-MF, and Smt-LF), using patient-specific settings of minimum and maximum current levels per electrode retrieved from a clinical database. The processed signals are first saved as XML files prior to the test being conducted. The input signals to the Checker were calibrated to correspond to an equivalent acoustic (loudspeaker) mean level of 60 dB SPL. CI recipients were seated in front of a touch screen and an XML file was streamed to the L34 speech processor from the MACarena test environment in combination with NIC. The CI recipients had to select the instrument that corresponded to the perceived sound from eight response buttons corresponding to the eight instruments shown on the touch screen display. Before testing began, the CI recipients practiced with a limited set of signals in familiarization and training sessions. In a familiarization session, the CI recipient pressed a button on the screen to listen to the corresponding sound. In a training session, feedback was provided as to whether the response was correct or wrong. If a response was wrong, the correct response would be indicated on the screen, and the same sounds could be repeatedly presented. The final test involved presenting each of the 8 instruments a total of 4 times (corresponding to a single presentation of each of the 4 submelodies) without feedback. 8 adult postlingual CI recipients performed the test. All subjects had at least 1 year's experience using a CI device. All of them used the Nucleus cochlear implant. The pitch ranking test was conducted using tone pairs consisting of a probe and a reference. Two references, D and G#, were used. Initially, the test was carried out with unprocessed sounds and NH subjects to establish that the tones could indeed be distinguished in their original form. The results from this test are shown in Figure 4 and confirm that the unprocessed tone pairs are generally easy to rank correctly, yielding scores that are significantly above chance. As expected, the scores also tended to be lower with smaller interval sizes. Mean results for unprocessed tones with both references D (a) and G# (b) in octaves 3, 4, and 5 with 1, 3, and 6 semitone intervals between the probe and reference tones. Pitch reversals, which would be indicated by negative scores, were not observed at all. Columns marked with an asterisk are significantly above chance according to the cumulative binomial distribution of mutually exclusive events; at least 7/8 correct answers are considered significant. Chance level is indicated by the dashed line. The results with sounds processed by the AMO for the Std, Smt-MF, and Smt-LF mappings are summarized in Figure 5. Scores in the pitch-ranking test were calculated in percentage from 0% to 100%, biased to −50% and normalized to be between ±100. The negative side indicates pitch reversals and −100% is complete pitch reversal. With the Std mapping (white filled bars), pitch ranking of tone pairs separated by larger intervals was easier than that of tone pairs with smaller intervals (e.g., the 6-semitones interval was easier than the 3 and 1 semitone intervals). The score with 1-semitone interval in octave 3 was close to chance level with reference D but was higher with reference G#. This could be due to the Std mapping compressing the input frequency range, especially towards the lower frequencies. As a result, the partials of tones at the lower end of the musical scale are more likely to be compressed than those higher up on the musical scale. This would cause tone pairs close to one another to be more difficult to resolve. Showing results with Std mapping (white), semitone mapping Smt-MF (gray), and semitone mapping Smt-LF (black) with reference tones D (a) and G# (b) using semitone intervals (1, 3, and 6) in octaves range from 3 to 5. Chance level is indicated by the dashed line. An asterisk between two columns indicates that the corresponding scores are significantly different from one another ( -test). When pitch reversals occur, which are indicated by negative scores, the significance test was calculated using the absolute values. Figure 5 also shows the results with Smt-MF (gray bars) and Smt-LF (black bars) mappings. Smt-LF generally performed significantly better in octaves 3 and 4 than Smt-MF and Std, particularly with reference D and smaller intervals. Smt-MF, apart from the pitch reversals observed, also performed better than Std, especially at small (1-semitone) intervals (octaves 3 and 5 with reference D). With Reference G#, notwithstanding the pitch reversals with Smt-MF, there were no significant differences observed between the three mappings. The pitch reversals with Smt-MF were most likely due to filtering out of partials below 440 Hz. Reference G4# (415 Hz) had its fundamental filtered out, leaving the first harmonic overtone as its lowest tone. Notice that there is no evidence that CI recipients can perceive missing fundamental . This may be due to the spread of excitation at electrodes. This can lead to pitch reversals when the probe tone has an unfiltered fundamental at a lower frequency than G4#'s first harmonic. In octave 3, the reference tone G3# (207 Hz) and the probe tones all have their fundamental filtered out, and pitch ranking can apparently still be reliably carried out with the remaining unfiltered overtones. Smt-LF also appeared to perform better than Smt-MF. One possible reason for this could be that it preserved the low frequency components, transposing them into a higher perceptual range, whereas Smt-MF tends to cut off frequencies below 440 Hz (A4) and therefore had poorer representation of the partials of tones, particularly in the lower octaves. Note that the frequency transposition that occurs with Smt-LF tended to also make the sounds unnaturally higher in pitch than with Smt-MF, which had a frequency mapping which was closer to the natural tonotopic characteristic frequency. In general, the pitch ranking was improved with Smt mapping compared to Std mapping. In the MCI test, different contour patterns were presented to NH subjects and CI recipients. The mean correct identification scores of the MCI test were evaluated for different octaves and different semitone intervals using Std, Smt-MF, and Smt-LF mappings. The results for NH subjects listening to the AMO outputs are summarized in Figure 6 and generally showed that the MCI scores improve with increasing interval size. With Smt-MF mapping, the scores were significantly better than those with Std mapping in octave 3 with 4 and 5 semitone intervals, as well as in octave 4 with 1 and 3 semitone intervals. In octave 3 with 1-semitone intervals, a significant decrease was found, most probably due to Smt-MF filtering out partials below 440 Hz, which can result in pitch reversals with the Smt-MF mapping at low frequencies due to strong confusion between rise-fall, fall-rise, fall-flat, and flat-fall in octave 3. Results with standard mapping (white), semitone mapping Smt-MF (gray), and semitone mapping Smt-LF (black) for NH subjects with AMO output. Three octave ranges (3, 4, and 5) were tested with different semitone intervals. Chance level is indicated by the dashed line. An asterisk between two columns indicates that the corresponding scores are significantly different from one another. Smt-LF mapping generally yielded significant improvements over Std mapping, with the exception that a significant decrease in the recognition score was found at octave 5 with 1 interval. For tones in octave 5, Smt-LF filters out all overtones above 1502 Hz, leaving only the fundamental in the melody contours. With only a single component which is at the same time spread out over several adjacent critical bands, the melody contour patterns with 1 semitone intervals become difficult to resolve, as illustrated in Figure 7. There was also a significant difference between Smt-LF and Smt-MF in octaves 3 and 4 with 2-semitone intervals. Spectrogram of the AMO output for the MCI rise-fall pattern in octave 5 with 1-semitone intervals and fundamental frequency of the root note equals 880 Hz, processed with Smt-LF mapping. Only the fundamental frequencies are left after Smt-LF has filtered out partials above 1502 Hz. The Smt-LF output is then resynthesized in the AMO using the tonotopical frequencies at the corresponding electrode positions, which results in a transposition of the center activity to around 4000 Hz . The inability or failure to resolve a melody contour is indicated by "flat" responses when the presented contour was not "flat." 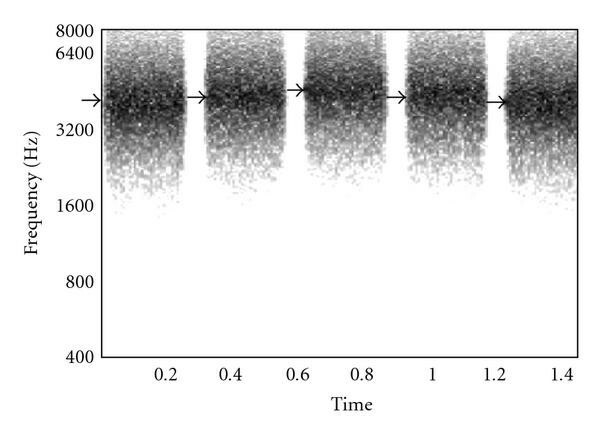 Figure 8 shows the mean number of occurrences of such failures to resolve melody contours. Std mapping generally yielded significantly more failures at octave 3 with 1 semitone intervals compared to either Smt-MF of Smt-LF, which is consistent with the expected compression of partials in the lower frequencies. The failures became less frequent as the interval size was increased or at a higher octave. For Smt-LF, there was a significant increase in such resolution failures at octave 5 with 1 interval. This corresponds to the reduction in scores in Figure 5 and is due to the Smt-LF mapping filtering out overtones higher than 1502 Hz, thereby reducing the tones to only their fundamental component and thus making it difficult to resolve tones in higher octaves. Mean frequency of occurrence of failures to resolve a contour pattern for NH subjects with AMO outputs for standard (white), semitone Smt-MF (gray), and Smt-LF (white) mappings. An asterisk between two columns indicates that the corresponding scores are significantly different from each other. The results in Figures 6 and 8 also show that there was generally little difference between the three mappings with large (4 and 5) intervals and these are therefore superfluous for this test. Also, MCI contours in the higher octaves (4 and 5), except at 1-semitone interval, are also largely redundant. Furthermore, Smt-MF mapping filters out too many of the partials from tones in octave 5, making it difficult to perform meaningful comparisons. Consequently, it was decided that the subsequent testing with CI subjects would concentrate on octaves 3 and 4, with 1, 2, and 3 semitone intervals. The MCI test was repeated using a reduced number (5 instead of 9) of contour patterns with CI recipients. Eight CI recipients took part in the MCI test with twice the number of repetitions and the same mapping conditions. Figure 9 shows the results for CI recipients with Std, Smt-MF, and Smt-LF mappings. With all three mappings, the identification scores generally improved when the interval size was increased from 1 to 2 semitones, whereas the differences in scores were smaller when the interval size was increased from 2 to 3 semitones. No significant differences were found between all three mappings. In octave 4, the Smt-LF score was lower than in octave 3, and also lower than the scores compared with Std and Smt-MF mappings. This decrease may be due to filtering out of high frequency partials with Smt-LF. This is illustrated in the electrodograms in Figure 10 for the rise-fall pattern in octaves 3 (Figure 10(a)) and 4 (Figure 10(b)) with 2 semitone intervals. It also shows that the Smt-LF pattern is transposed to channels with higher characteristic frequencies, and that high frequency overtones are filtered out from the 4th octave signal's pattern (see Figure 10(b)), leaving less cues in the resulting signal to perform the contour identification compared to the 3rd octave signal's pattern as shown in Figure 10(a). MCI test results with CI recipients for standard (white), semitone Smt-MF (grey), and Smt-LF (black) mappings. Two octaves (3 and 4) were tested with semitone intervals from 1 to 3. Chance level is indicated by the dashed line. There were no significant differences found between the three mappings. Electrodograms for the MCI rise-fall pattern in octave 3 (a) and octave 4 (b) with 2 semitone intervals, using Smt-LF mapping. Smt-LF, which has an upper cut-off frequency of 1502 Hz, has filtered out most of the octave 4 signal's higher partials. The two electrodograms also demonstrate how Smt-LF results in a transposition to higher frequencies (see ). The CI recipients' failure to resolve melody contours is shown in Figure 11. A significant decrease in the number of failures to resolve the contours with Smt-MF at octave 3 with 1 interval was found in comparison with Std mapping. This was significantly smaller with Smt-LF mapping. The difficulties in resolving the contours with Std are most likely due to the poor representation at lower frequencies. In octave 3, with Smt-MF, the lower frequency partials (the fundamental in particular) have been filtered out, but this was not the case with Smt-LF (see Figures 12 and 13). Even with the semitone mapping, lower partials are generally better resolved than higher partial, due to the logarithmic nature of the frequency-to-channel assignment, resulting in a spatially denser representation of the higher partials. Together with effects like the spread of excitation, this makes it more difficult to resolve contours when the lower partials are missing. The importance of the lower partials is supported by the observation that with Smt-LF in octave 4, where the higher frequency partials have been filtered out, the performance improved compared to octave 3. Mean frequency of occurrence of failures to resolve a contour pattern for CI recipients for standard (white), semitone Smt-MF (gray) and Smt-LF (black) mappings. Two octaves (3 and 4) are plotted with different semitone intervals. An asterisk between two columns indicates that the corresponding scores are significantly different from one another. Results of Smt-LF (upper) mapping for the fall-rise pattern in octave 3 (a) and octave 4 (b) using 1-semitone intervals. It shows also results of Smt-MF (lower) mapping for the same pattern in octave 3 (a) and octave (4) right with the same semitone intervals. 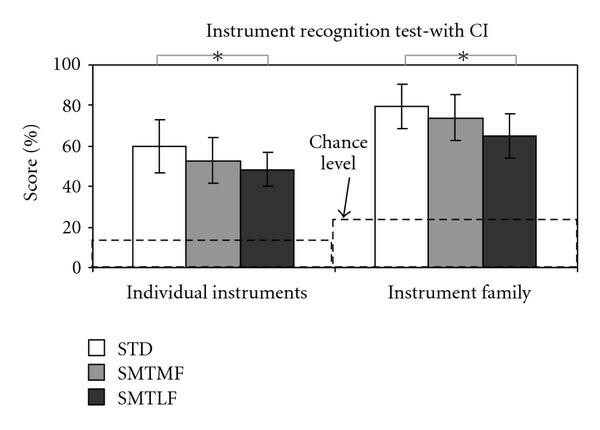 Results of individual musical instruments and instrument family recognition test with CI recipients using standard (Std) (bricked) and Smt-MF (gray) and Smt-LF (black) mappings. Dashed lines illustrate chance level. An asterisk between two columns indicates that the corresponding scores are significantly different from one another. Overall, CI scores were lower than simulation scores. The significant benefits of semitone mappings does not exist in CI users with MCI test, and this may be due to requirement of a long-term familiarization or more CI subjects. However, a significant reduction in failure to resolve tone is noticed with Smt-LF. More importantly, unlike NH subjects listening to simulations, CI users did not seem to have pitch reversals because their Smt-MF scores were not poorer than their Std scores in octave 3 with 1-semitone interval condition (see Figure 9). Eight CI recipients took part in the IR test. Their task was to identify the instrument used to play a musical piece. There were eight instruments from four instrument families. The results were analyzed for the percentage correct scores for identifying the individual instrument (8 possibilities) and the instrument family (4 possibilities). Figure 14 shows the IR scores with CI patients with the three mappings (Std, Smt-LF, and Smt-MF). In general, it shows that the Std mapping was preferred. Piano and Clarinet tones were better recognized using Smt-MF mapping. Whereas, Smt-MF was significantly higher than Std and Smt-LF using the Clarinet instrument. One reason may be because in general Clarinet partials are more harmonically related than other instruments like the Cello (see Figure 15). However, Violin was better recognized with Smt-LF and Smt-MF than Std mapping. Instrument recognition scores with CI patients for different instruments using Std (white), Smt-MF (gray), and Smt-LF (black) mappings. A significant enhancement was detected with the Smt-MF using the Clarinet instrument. A polar representation of frequency components along an octave spacing binary spectrum for both Clarinet (a) and Cello (b) instruments. It illustrates that angular distance or in other words semitone spacing between different components in the Clarinet is almost equal and this may be one reason for significant instrument recognition of Clarinet with Smt-MF. Partials amplitudes were extracted from logarithmic amplitude FFT with a threshold at −90 dB and then were replaced with a constant value. Figure 15 shows a comparison between unprocessed tones from Clarinet and Cello instruments. The figures represent a polar representation of frequency values of existing partials allocated on a binary spectrum to represent octave spacing. The figure shows that the angular differences between partials in the clarinet instrument are almost equal, which is not the case with Cello (see Figure 15(b)). This equal spacing of harmonics in a natural instrument was significantly recognized with Smt-MF as shown in Figure 14. Figure 16 summarizes the average results with Std, Smt-MF, and Smt-LF mappings. The average identification scores decreased significantly with Smt-LF mappings compared to Std mappings for individual instruments as well as instrument families. This may be because characteristic differences between instruments such as timbre are contained in the temporal fine structure rather than the tonotopic frequency allocation . The three mappings Std, Smt-LF, and Smt-MF use different window lengths of 128, 512, and 512, respectively, for their processing algorithms. In addition, Smt-LF halves the sampling rate to increase the frequency resolution for frequencies below 1054 Hz, which account for the majority of its input frequency range. Consequently, the temporal resolution is expected to be best with Std and poorest with Smt-LF. Additionally, as these strategies do not encode the temporal fine structure properly, patients may only be relying on the spectrum to identify different instruments. Since the Std mapping is covering the widest frequency range (180–7800 Hz) compared to semitone mapping Smt-LF and Smt-MF ranges (130–1502 Hz) and (440–5009 Hz), respectively, the highest amount of spectral information is transmitted with Std mapping. Another possible reason could be that the subjects were more familiar with the Std mapping, which is very similar to the mapping used in their daily used speech processor, and this may illustrate the need of a long term familiarization with Smt mapping. 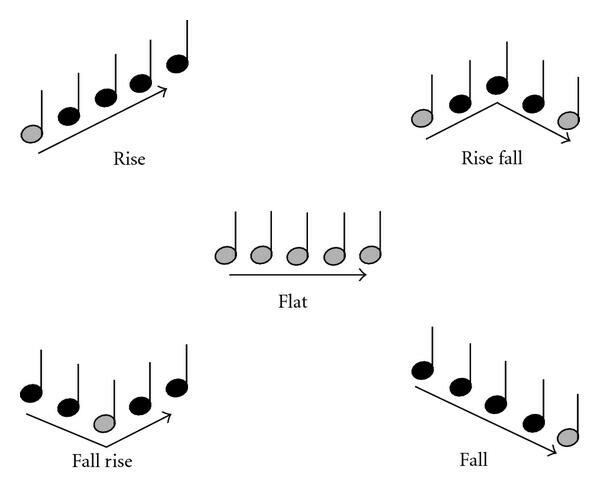 Although implant recipients perceive basic rhythm patterns similarly to NH subjects , perception for pitch, pitch sequences, and melody recognition is significantly poorer than that of NH [15–21]. Pitch ranking was tested with two reference tones (D and G#) with different semitones intervals for the three mappings (Std, Smt-MF, and Smt-LF) using the AMO with NH subjects only. The AMO is based on a noise band vocoder . One of the parameters needed for the AMO was the width of stimulation. The authors in [5, 10] found that a width of stimulation of around 1 mm produced electrode discrimination similar to that of average Nucleus CI24 recipients. Prior to using the AMO for testing with NH subjects for the present study, a pilot test was initially conducted to examine the effect of the width of stimulation. 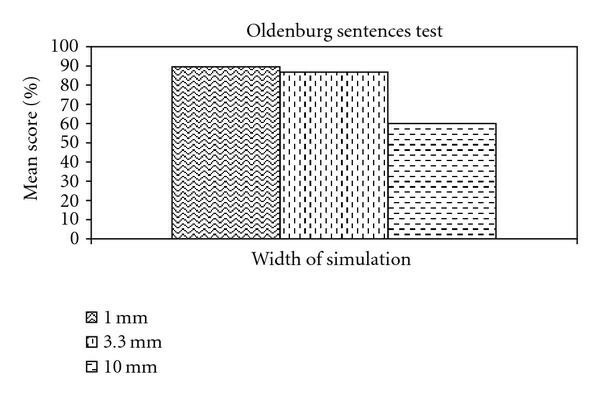 The Oldenburg sentence recognition test [22–24] in quiet was chosen for this purpose with the Std mapping using different widths of simulation (1, 3.3, and 10 mm). The results shown in Figure 17 indicate that widths of 1 and 3.3 mm gave very similar results (90% and 87%, resp.). With 10 mm, the results were very poor and were considered to be not representative of CI recipients performances . A 1 mm width of stimulation was selected for further tests with the AMO as this matches well with the recommendation by [5, 10]. Average correct scores for the Oldenburg sentences test performed with different widths of simulation (1, 3. 3, and 10 mm) for the AMO using two lists with 10 sentences each. Only native German speaking subjects were tested. The pitch ranking test with NH subjects was intended to examine whether the Smt mappings would indeed produce better representation of complex tones over Std mapping. Results with unprocessed synthetic complex tones confirmed that (a) the test material was suitable for such a task, and (b) the subjects were able to perform the task. Results tended to be poorer with smaller intervals between the probe and reference, and also poorer in a lower octave range. This is consistent with the reduction in critical band size at the frequencies of concern (i.e., below 500 Hz) . The pitch ranking results with the AMO showed that Std mapping was significantly poorer than either of the Smt mappings for the tone pair D-D# (1-semitone interval) in all three octave ranges. With 3-semitone intervals, Std mapping was significantly poorer than Smt-LF mapping at the lowest octave (D3-F3) only. With a higher pitched reference (G#), these difficulties with the Std mapping were not observed. This is consistent with the fact that Std mapping compresses the representation of lower frequency partials, thereby making it difficult to distinguish between tones that are close to each another. Smt mapping in general improves the representation of the partials. Pitch reversals were seen with the Smt-MF mapping in octave 3 with the D reference, and in octave 4 with the G# reference. A closer examination of the power spectrum estimates for the AMO-generated tones, for instance, G4# and D5 (with fundamental frequencies of 392 Hz and 554 Hz, resp. ), shows that the loss of partials below 440 Hz filtered out by Smt-MF shifts the lowest remaining partial of G4# to a frequency higher than that of D5 (see Figure 18). Thus, the loss of lower frequency partials due to the cutoff frequency of Smt-MF is a likely cause of the observed pitch reversals. Power spectrum estimates for both the G4# reference (black) and D5 probe (6-semitone interval) (gray) signals for the unprocessed tones (a) and using Smt-MF mapping after AMO processing (b). The fundamental frequency of the reference tone (414 Hz) is filtered out because it is below 440 Hz (shaded area in (a)), while that of the probe (585 Hz) is retained. After Smt-MF processing with the AMO, comparisons of the unfiltered first overtone's peak above the theoretical noise floor of the power spectral density (−48.2 dB) which is double the theoretical noise floor of FFT in dB  (shaded area in (b)) in the reference (1070 Hz) with the fundamental of the probe (~859 Hz) would then result in a pitch reversal. These results cannot be related directly to CI recipients, as the AMO only produces an approximation to the CI perceptions . However, the results did show that in principle, Smt mapping has the potential to produce better pitch ranking of complex tones that possess a harmonic structure. Pitch reversals arising due to filtering out of the lower frequency partials had a negative effect on the identification scores. Smt-LF mapping filters out partials below 130 Hz and above 1502 Hz, while Smt-MF mapping filters out partials below 440 Hz and above 5009 Hz. For the range of tones tested here, Smt-LF caused no loss of lower frequency partials due to filtering. Smt-MF, on the other hand, is more likely to result in the lower partials of the lower pitched tones being affected by its band-pass filter cutoff. Smt-MF mapping was designed to be as close as possible to the characteristic tonotopic frequencies of the electrode array according to the Greenwood function , assuming an average cochlea length of 33 mm and an insertion depth of 22 mm . It is not possible to map Smt-LF to characteristic tonotopical locations because the lowest input frequency of 130 Hz is far too distant from the characteristic frequency of the most apical electrode (whose location should correspond to a characteristic frequency of around 400 to 600 Hz) according to Greenwood. Instead, Smt-LF mapping effectively transposes frequencies from 130 to 1502 Hz into a higher tonal range. This may simplify pitch ranking of tones in the lower frequency octaves (e.g., octave 3) but may cause them to be perceived as unnaturally high pitched. The results nevertheless demonstrated that Smt mapping may improve pitch ranking due to improving the frequency representation. The pitch-ranking results also showed that the test has different sensitivity in different tonal ranges. With the G# reference, it was not sensitive enough to detect differences between the various mappings being investigated. Pitch ranking is possibly a too simple task, and further studies should involve a more complex test that is sensitive enough to show differences between mappings. Such a test will be first assessed with NH subjects and then subsequently with CI recipients. Melody can be described as a group of tones that are perceived as a single entity . Different melody tests exist, such as simple melody recognition with lyrics  or a sequence of familiar notes [30–32], complex song recognition, and complex song appraisal . Although it would have been more appropriate to perform a melody test, the existing tests do not involve the perception of melody alone but also involve other perceptual mechanisms such as pattern recognition as well as memory (familiarity). For instance, familiar melody recognition has been used to directly asses CI listeners' music perception abilities [18, 21, 33, 34], but general results showed that CI recipients are performing much worse than NH subjects . In addition, Lynch et al. found that musical experience or education and cultural background greatly influenced melody recognition performance when notes within a melody were mistuned . The authors in  measured CI recipients' melody and rhythm discrimination using the primary measures of musical audition (PMMA) test. Their results showed that CI recipients were more sensitive to changes in rhythm than in melody. Familiar melody identification may involve paying attention to the pitch contour of the melody . As such, deviations from the expected intervals for a familiar melody may strongly affect identification performance. CI recipients may depend less on the exact intervals and more on the general contour of changes in pitch, rhythm, and timbre. Because CI recipients' perception of these musical aspects will be limited by the amount of information transmitted by the devices, we chose to investigate the CI recipients' ability to identify melody contours. Galvin et al. introduced the MCI test which assesses the listener's ability to detect and identify interval changes between successive tones in a short sequence . Among the advantages of this test is that confounding factors such as rhythm can be eliminated, and the contour patterns do not need any previous familiarity for the listener to perform the task. 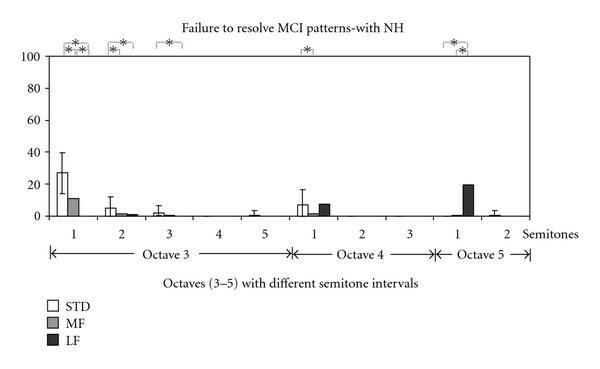 The results of the MCI test with NH subjects showed similarities with the results from the pitch ranking test in that significant improvements over Std mapping were obtained for Smt-LF mapping, particularly in octave 3 with 1 and 3 semitone intervals, as well as in octave 4 with 1-semitone interval. However, the pitch ranking improvements were found with the D reference but not the G# reference, whereas the MCI patterns had a root note of A, and the tone intervals were more similar to the pitch ranking intervals with the G# reference. Thus, the pitch ranking and MCI results cannot be directly inferred from one another. The MCI test is probably a more difficult task as the listener had to concentrate on the contrasts between up to 5 tones, whereas the pitch ranking task only involved a single contrast. A given tonal range which was relatively easy for pitch ranking may thus be expected to be more difficult when multiple contrasts are involved. The observation that the MCI test results showed the same trend at a higher "reference" or "root" tone suggests that MCI is not merely a more complex form of pitch ranking involving sequential tones but is also a more difficult form. With Smt-MF, the poor MCI results in octave 3 with 1-semitone intervals was most probably caused by pitch reversals in specific tones as a result of the lower partials being filtered out. Note that pitch reversals in specific tones are probably more crucial for contour patterns with smaller intervals, which are inherently more difficult to resolve. When larger intervals are involved, the subjects may still be able to use the other segments of the contour to perform the identification. With Smt-LF, there was a significant decrease in contour identification at octave 5 with 1-semitone intervals most likely because of filtering out high frequency partials, resulting thereby in some patterns being identified as flat when they were not. The results with these particular patterns were further analyzed, and the inability or failure to resolve melody contours in this manner was found to correspond to the observed reduction in identification score. The inability to resolve partials also accounts for the significantly higher number of errors with the Std mapping at octave 3 with 1-semitone intervals, since frequency components in the octave 3 range tend to be mapped to a very small number of channels with the Std mapping. The number of patterns was reduced to 5 contours (rise, rise-fall, flat, fall-rise, and fall) for testing with CI recipients. 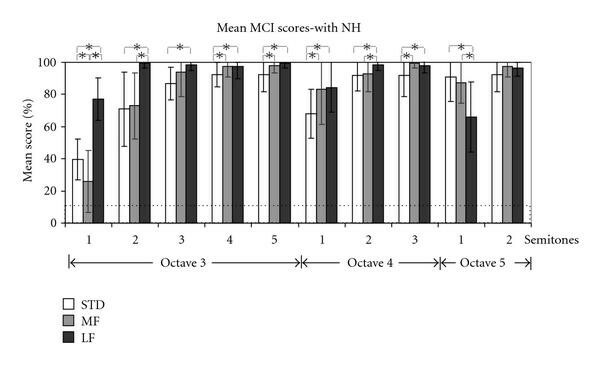 Based on the results from the pitch ranking and MCI tests with NH subjects, it was also decided to restrict the MCI test to octaves 3 and 4, using the more difficult interval-size conditions, namely with semitone intervals 1 to 3 in each contour. Incorporating virtual channels, thereby increasing the number of available channels from 22 to 43, for testing with CI recipients is expected to produce improvements in performance. This study, however, was aimed primarily at comparing Smt mapping against the Std mapping, and as the CI subjects did not use virtual channels in their regular daily routine, it was decided that the number of varying parameters should be minimized for the comparisons. With 22 channels, the resolution of the frequency to channel mapping was also reduced by a factor of two, meaning that always two semitones will be mapped to a single channel. The MCI test was therefore carried out with both NH and CI subjects using 22 channel mode in order to be able to compare the results directly. Patients did not have a short-term or long-term adaptation to Smt mapping due to technical constrains. Since Smt mapping uses slightly different processing technique (Subbands and mapping matrices) which requires building a new firmware and writing it to the implant processor in order to provide patients a long-term adaptation and this is not feasible except in manufacturer labs. However, performance may gradually improve with short-term and long-term adaptations with Smt mapping. The MCI test results with CI recipients showed a general improvement in identification scores with increasing interval size. The enhancements found of Smt-LF and Smt-MF in the average scores were not significant for a given octave and interval size condition. The Smt-LF scores appeared to be lower for the octave 4 compared to the octave 3 conditions, most probably due to filtering out of higher partials resulting in less cues to distinguish between the contour patterns. Both Smt-MF and Smt-LF mappings were better than Std mapping in terms of resolving contours, especially in lower octaves (octave 3) with small (1-semitone) interval sizes, where Smt-LF mapping was statistically significant and this emphasizes that semitone mapping may be advantageous to the Std mapping. Again, this is consistent with the expectation that Std mapping is unable to resolve tones well in these frequency ranges, and this is remedied by Smt mapping. In general, Smt mapping showed some improvements over Std mapping with the MCI test. However, melody contour is only one aspect of music perception. Timbre is another aspect that is involved in characterizing different instruments . Timbre depends on the frequency spectrum as well as the temporal fine structure of the perceived sounds. To investigate whether music with semitone mapping would be perceived as musical, a music IR test was carried out. In this test, the timbre is coded more in the temporal patterns rather than the frequency spectrum. 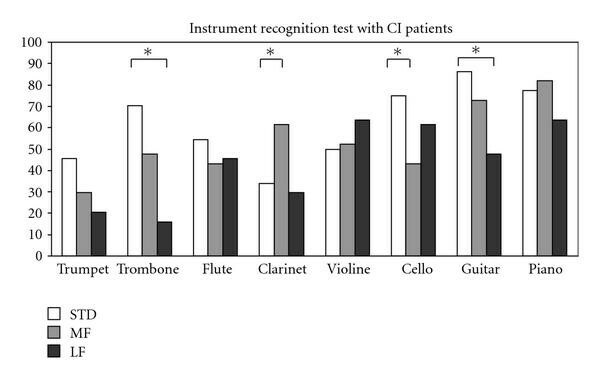 Results with CI recipients in the IR test showed that there was a statistically significant enhancement of Smt-MF over the Std mapping with Clarinet. However, in general there was a decrease in average individual instrument and instrument family recognition scores with semitone mappings. The decrease was found to be significant with Smt-LF mapping. Semitone mapping is based upon modifying the frequency allocation compared to the Std mapping of the ACE strategy and uses different number of points in the FFT frames and the overlap . Because there were no changes to the specific coding of temporal information for all three mappings, the Smt mappings effectively changed the spectral density representations compared to the Std mapping. Thus, the CI recipients may have been strongly relying on the power spectral density of signals as suggested by  for identifying the instruments. One reason may be the increased window size (number of points) used in Smt-MF and Smt-LF compared to Std (512 versus 128) and the additional subband decomposition of Smt-LF improved the frequency resolution with Smt mapping at the expense of decreasing the temporal resolution. Furthermore, the Std mapping covers a range from 188 to 7980 Hz, while Smt-LF and Smt-MF cover the frequency ranges from 130 to 1502 Hz and from 440 to 5009 Hz, respectively. Since the Std mapping has a wider input frequency range than the Smt mappings, the average encoded spectrum will be greater than with either Smt mappings. Thus, the larger spectral representation as well as the CI recipients' familiarity with the Std mapping are other likely reasons for its superior performance in the IR test. This also highlights the importance of training as well as the need to encode appropriate cues for specific purposes (temporal fine structure in this case for timbre perception). An additional reason may be the harmonic relationship of frequency components in an instrument sound, the more the harmonic structure it has, the better recognition with semitone mapping especially Smt-MF is expected to be. Instrument recognition may be dependent on the energy per octave. Furthermore, the observation that Smt-MF performed better than Smt-LF could has been due to the effective transposition to a higher pitch range that occurs with Smt-LF mapping. The resultant sounds were commented by CI recipients as being unnaturally high pitched and unpleasant, making it more difficult for them to distinguish and identify the instruments. Pitch ranking and melody contour identification  showed that there was an improvement with semitone mapping over Std mapping. The pitch ranking results support the hypothesis that better preservation of the harmonic structure through semitone mapping will improve the discriminability of complex tones. Similarly, the hypothesis that this improvement in discrimination can be applied to a more complex task such as melody contour identification appears to be also justified. However, the frequency limits of both Smt-LF and Smt-MF can produce difficulties when not all partials of complex tones are present. This is more likely to occur when the tones have partials close to the frequency limits of either semitone mappings. The improvement differed between Smt-MF and Smt-LF. Although Smt-LF mapping provided better pitch ranking and melody identification results, the perceived sounds were much higher in pitch and some CI recipients did not like it. Smt-MF maps the tones closer to their natural characteristic frequencies and probably sounded more natural than with Smt-LF for this reason. The instrument recognition test showed a significant enhancement with Clarinet using Smt-MF but in general revealed a significant decrease in average scores with semitone mapping. The results illustrate that semitone mapping alone is not sufficient to improve instrument recognition of all instruments. Temporal fine structure information, which is also important to discriminate timbre (and hence identify instruments), is not explicitly coded in semitone mapping, and may need to be included in future developments of coding strategies intended to present music. 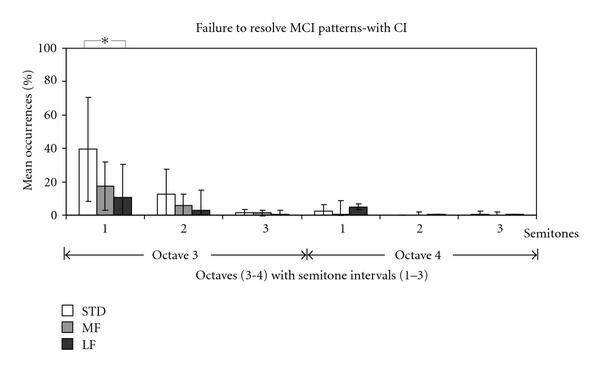 The benefits of semitone mappings were significant in simulations but were not significant in CI with MCI test. Long term familiarization with the new mappings and use of VCs may be necessary before significant benefits in CI users can be observed. This project was supported by Swiss National Science Foundation Grant no. 320000-110043. The authors are grateful to Dr. Michael Büchler for his support in the earlier stages of the experiments.